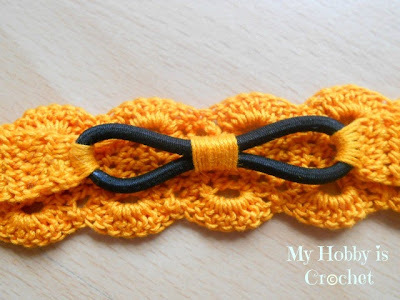 These crochet thread headbands are not only beautiful and stylish, but also practical and comfortable to wear due to the hair tie at the back. 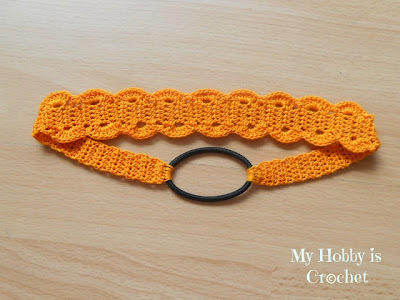 Make one in each color to match your outfits! Which version do you like it better? With or without the flower applique? For myself I prefer it simple and elegant! I wear it a lot! 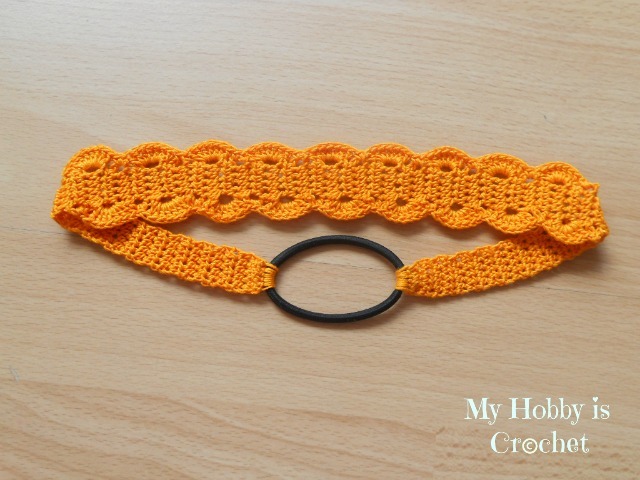 This headband is sizes for teen/adult women, but you can adjust for smaller sizes. 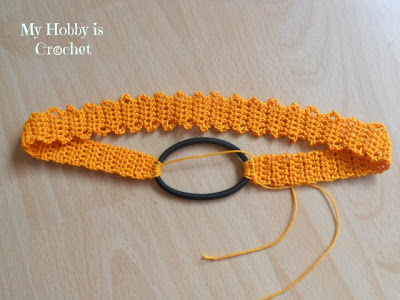 One way it is to make less rows till the Bruges Lace part of the headband as in the pattern indicated, for a toddler size I would make approx. just the half of the rows, maybe 10 rows, but I haven't tested it! 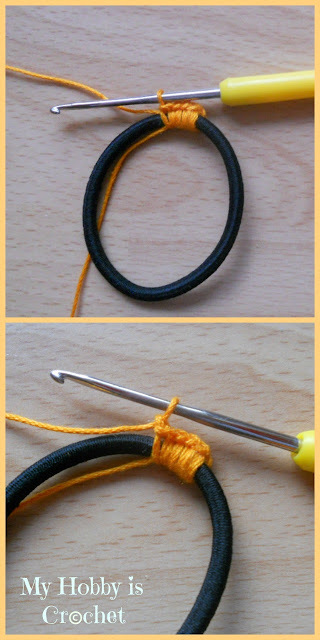 Take the hair tie; we will cast on directly on it. 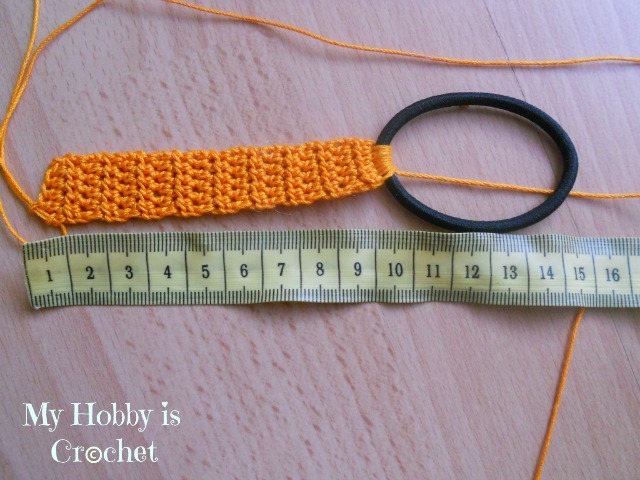 Rows 4-18: repeat as row 3, until your piece measures approx. 9 cm. 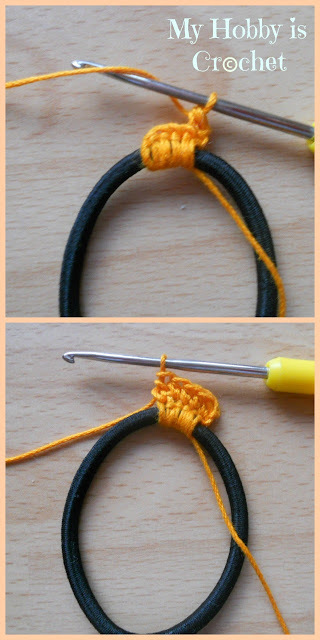 NOTE: The diameter of the headband can vary, depending on how much your hair elastic stretches. If you want the headband to stand tighter on the head, make less rows as here indicated. 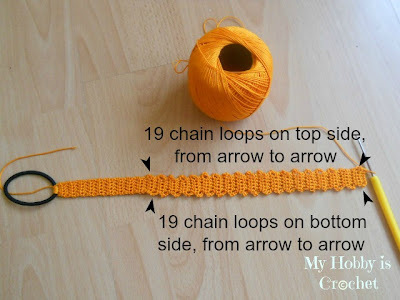 For the next rows, repeat as row 19 until on each side of the headband you'll have 19 chain loops. See the picture below. The section with ch loops measures 21 cm. After you have 19 ch loops on each side, you will continue for 18 rows the same way as the first part of the headband: 1hdc in each hdc across, ch1 and turn. 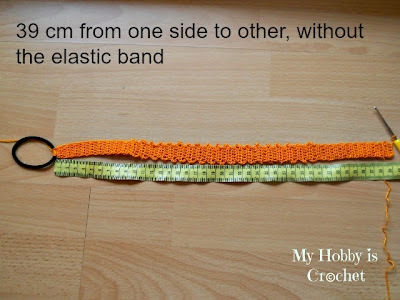 In the picture bellow it is shown the headband right before casting on again on the elastic band. 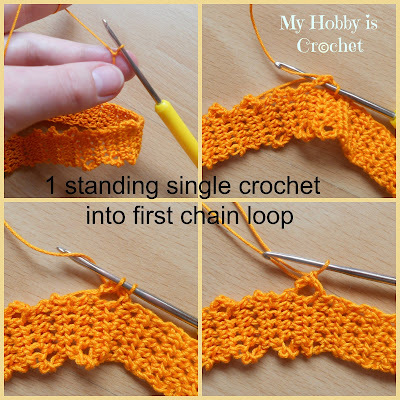 Casting the second tail on the elastic: make 1 sc in each of the 5 hdc of previous row and around the elastic: first stitch in one hdc, then around the elastic, for each stitch of the row, like in the photo collage below. After casting on the elastic, it will look like in the picture below. 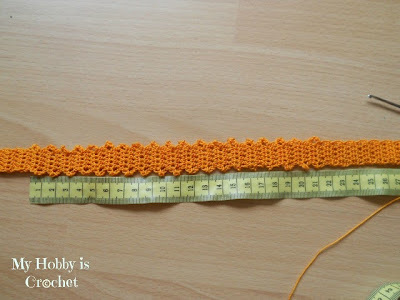 Observe that the top of the stitches (the seam) are at the edge of the elastic. 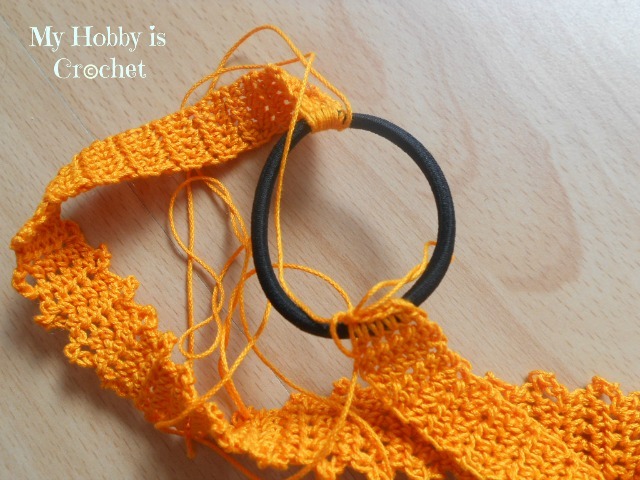 Pull the seam to the inside of the headband for a nice, finished look. Secure by sewing the last row with the previous row. 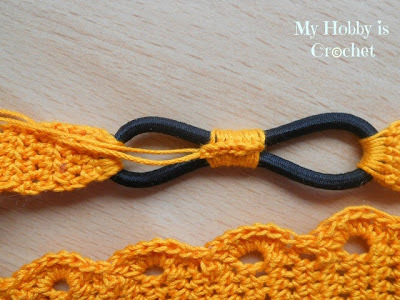 The top of the stitches are at the edge of the elastic. 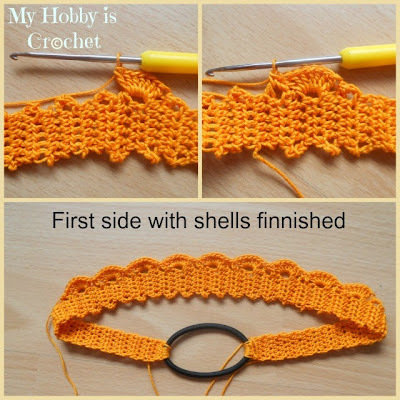 Second side: repeat as for the first side. 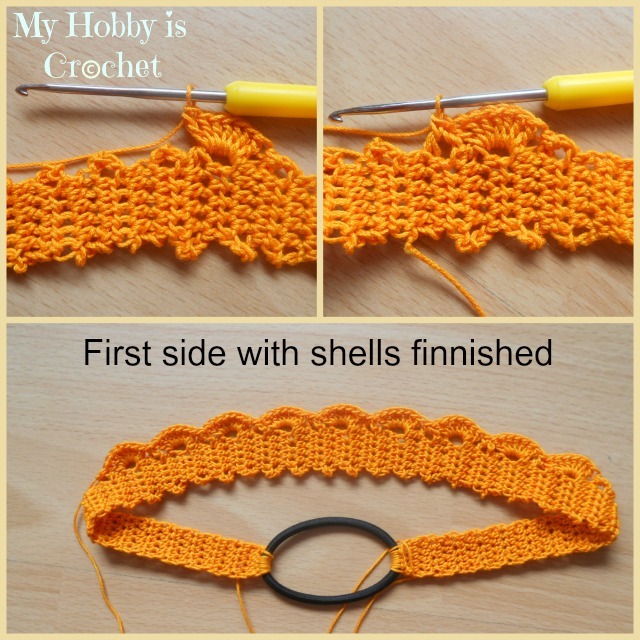 You should have 9 shells on each side. 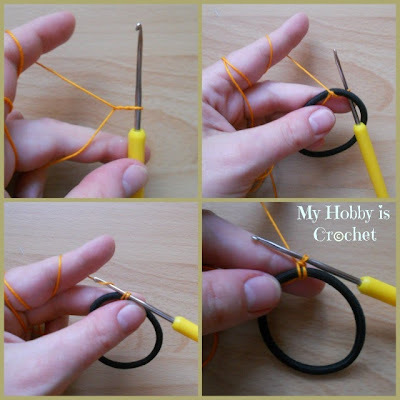 Right in the center of the elastic band, make 1 standing single crochet around both sides of the elastic band and than 5 sc more around both sides. Cut yarn. Fasten off. 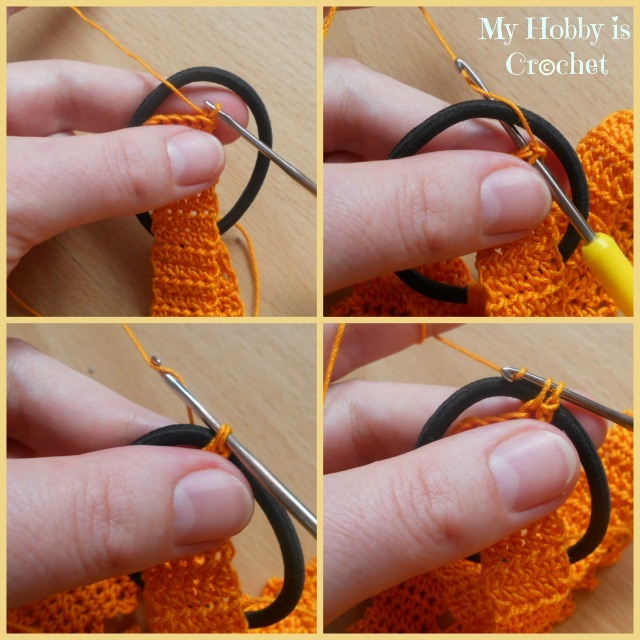 Hide the edges of the stitches to the inside. Sew the yarn tails. This is how it will look the wrong side, after hiding the seam to the inside. That's it! You made it! The flower pattern can be found on my blog post Double Layered 8 Petal Flower. 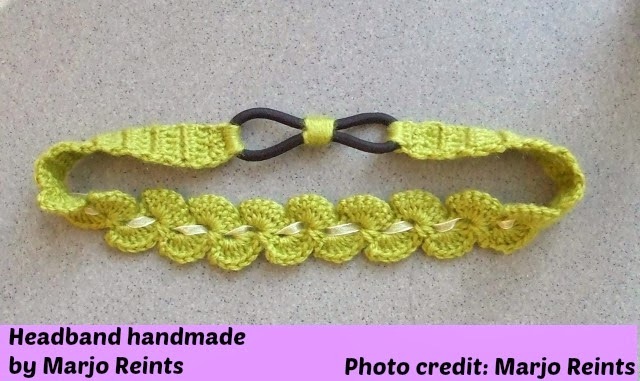 Here are some pictures shared by a very talented crocheter, Marjo Reints, who combined this Thread Headband pattern with my Free Pattern Crochet Bracelet with Heart Button . Aren't they lovely? 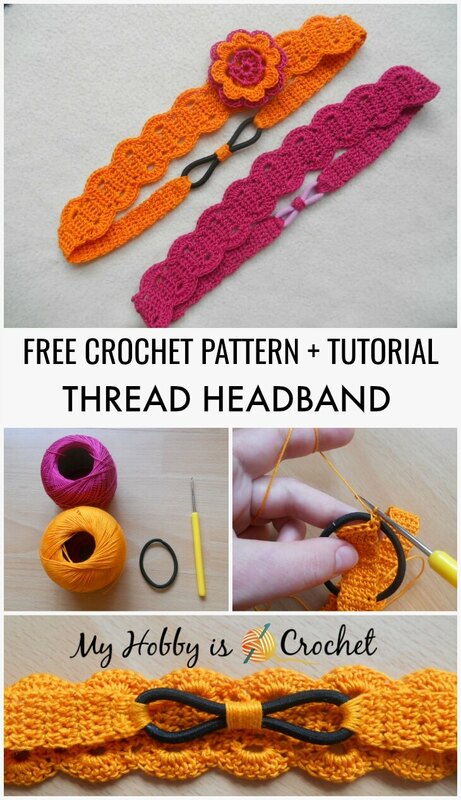 I would love to see your headbands! Please share your pictures on my Facebook Page. I hope you enjoy this pattern!